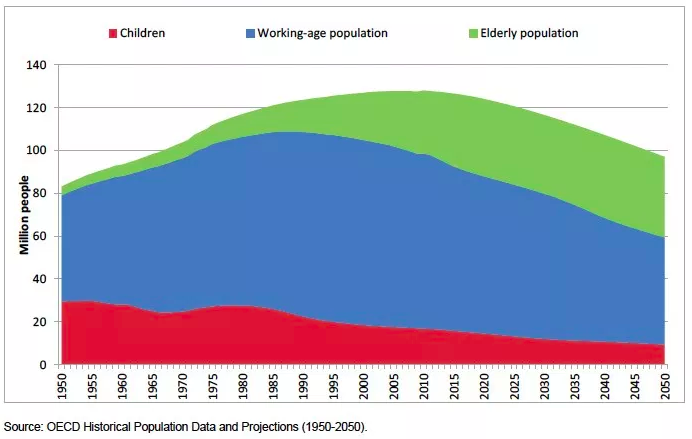 Japan’s shrinking working-age population is a demographic timebomb. Compared with the 65.3 million working-age people in 2017, the Health, Labor and Welfare Ministry expects there to be just 60.82 million in 2025 and only 52.45 million in 2040. These predictions are based on Japan’s many years of declining birth rates and subsequent ageing population. In 2018, there were 921,000 births and 1.37 million deaths, meaning Japan’s population fell by 448,000 people. That was its largest ever annual natural population decline. Ageing populations are a major challenge to business growth. One of the counter-measures the Japanese government has been trying to put in place is a change in traditional gender role definitions. The stereotype of the salaryman, wedded to his job, working exceptionally long hours while his wife stays at home looking after domestic matters has become part of the problem. Against this background of entrenched attitudes about whose responsibility it is to stop working and stay at home looking after children, Japanese women have been reluctant to give up their hard-won equality-at-work gains. In the early 1970s, there were more than a million marriages per year – a rate of more than 10 per 1,000 of the population. But by 2017, 606,863 couples married, and the marriage rate had fallen to just 4.9. Workplace equality is a relatively recent legal concept in Japan; the 1986 Equal Employment Opportunity Law gave women access to careers without discriminatory barriers. Several other developed economies face a similar set of challenges. Their experiences may help shape further policy decisions in Japan. Poland is one such country. Like Japan, its birthrate is falling and by 2050 half of its population will be aged 50 or more, while the overall population will be 10% smaller than it was in 2015. The number of working-age Poles will fall by 28% in that time. Part of the challenge facing Poland has been the large proportion of young people who emigrated in the wake of the 2004 European Enlargement Act, which gave them the right to live and work elsewhere in the EU. According to the European Commission, the effect on Poland’s GDP per capita of this demographic timebomb will be a drop from 4.7% growth to 3% (of GDP) from 2021 onward. The number of working-age Poles will fall by 28% by 2050. In 2015, a campaign aimed at boosting Denmark’s birthrate launched with the tagline “Do it for Mom”. The tongue-in-cheek campaign suggested older people who wished they were grandparents should send their adult children off on exotic vacations, offering discounts for couples booking their trip together. The World Bank’s opinion on national governments investing in so-called pro-family policies is that there is no one simple route to success. “Experience in other countries suggests a three-pronged approach: get people to work longer; get more people to work within the working-age group; and get those who work to work better, to produce more,” it states in a report on the ageing Polish population. Shifting the perceptions of what it means to be a man in modern-day Japan is slow work, however. Although fathers are entitled to 52 weeks of parental leave, by 2017 only 7% had done so. The government of Prime Minister Shinzo Abe has set itself an ambitious target of getting that number up to 13% by 2020. Japan still has a challenge on it hands to improve gender equality, though. The latest Global Gender Gap report saw it ranked 110 out of 149 economies, with economic participation and opportunity an especially low-scoring pillar. Without a reversal in some of these trends, Japan faces the prospect of lower tax receipts and a declining workforce to shoulder the burden of rising healthcare costs for the elderly.